Saul waited for the local grocer to open. Joe had forgotten to bring an important bag of supplies. So, it became Saul’s job as a junior member of the research team to head to the nearest grocer. 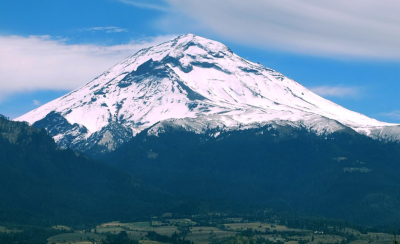 He would have to catch up with the rest of the team who were already on their way to the top of the Popocatépetl volcanic mountain. His watch showed that it was half past five in the morning and the local grocer should be open any minute now. From where he stood outside Pepito’s Grocer, he could see the volcano with its ash cloud, quietly brooding over the nearby city. Although Saul had gone dangerously close to many active volcanoes around the world, he could not help but feel nervous on this trip. The volcanic shakes under Popocatépetl had increased over the past few weeks. It was only a matter of time before it erupted. Their task that day was to decide how soon evacuation of the nearby city should begin. Saul knew the volcano was no respecter of time—there was nothing to stop it from erupting with the team so close to the crater! The thought of having to run from boiling-hot lava made Saul shudder, but the sound of Pepito opening his storefront shook him from his fearful thoughts. Old Pepito greeted him with a friendly smile. “You are visiting the smoking mountain again today, eh?” Pepito called out as Saul crossed the street and made his way into the grocery. Saul nodded with a smile. The two exchanged friendly greetings and Saul quickly set out to fill his basket with all the things on the list he had written on the palm of his hand. Then, he brought all the items to the counter where Pepito was waiting patiently for him. “The smoking mountain is still sleeping. Why must all you scientists go up there to wake it up?” Pepito grumbled as he slowly packed Saul’s supplies in pink plastic bags. “The volcano is active but our data shows that it may take many more years for it to wake up, Pepito. There’s nothing to worry about now. The volcano is not going to erupt today,” Saul replied, trying to assure Pepito that there was nothing to fear.